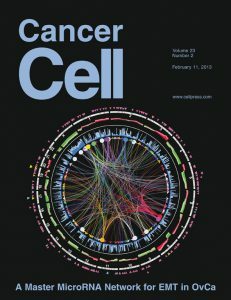 The research of Yang lab is focusing on using bioinformatics and experimental tools to identify novel cancer-driving none-coding RNAs (ncRNAs), modeling ncRNA down-stream regulatory network, and characterizing ncRNAs’ function in tumor initiation and progression using cancer cell line and mouse models. Our integrative strategy has led to the discovery of miR-506 as a novel tumor suppressor in ovarian cancer by regulating EMT (Cancer Cell, 2013), cell senescence (J Pathol, 2014), and HR pathways (JNCI, 2015). In gastric cancer, we successfully identified a key miRNA regulatory network for cancer metastasis and poor overall survival by targeting ZEB1 (Clin Cancer Res, 2014 and PNAS, 2015). Recently, we performed an integrated analysis of the lncRNA epigenetic landscape and discovered a novel intergenic lncRNA gene, EPIC1. We have further demonstrated that EPIC1 promotes breast cancer tumorigenesis by interacting with MYC (Cancer Cell, 2018 and Nat Commun, Accepted). These studies have also resulted in high impact publications and a vibrant training environment.